He wanted to wish me Happy Easter and Bonnes Paques, as they say in French. since then, these files were delivered to him. But will he get to see them? to plead ‘not guilty’ for things they did do. I am sister to Maurice John KIRK (dob 12.3.45) who is currently being held in Cardiff Prison awaiting sentence for a trumped up crime. He is thus unable to furnish information personally. I live in Jersey but was in Cardiff last month and attended a ‘victims of ABMU’ meeting on Tuesday 26th March 2014 in Bridgend. he continually disproved in the magistrates’ courts of South Wales over a period of some 18 years. I believe the record would show that he won over 80% of his appearances. Weekly he would be stopped and asked to produce his driving licence and insurance documents at some police station or other as he went about his business. injured animal if surgery was closed. Our father was also a veterinary surgeon and held the same view that an animal in pain required immediate attention. back to his car to treat in the surgery. He was reported to the Royal College of Veterinary Surgeons where his motoring offences were noted. the vet and did not submit this evidence to the Royal College. to the Civil Court for their behaviour over the last 18 years. duly placed him in C CLINIC for 28 days. During this time the DOCTOR and team was unable to come to a conclusion about his diagnosis and so twice more the court was asked to extend the incarceration in C Clinic. (My brother said it was a truly frightening place to be as most of the inmates really were suffering from mental illness). E. My brother was determined to defend himself in court as he knew the real story and he would not have been able to afford legal representation and anyway, could find no reliable Welsh defence lawyer. should be incarcerated to Ashworth Hospital for LIFE! 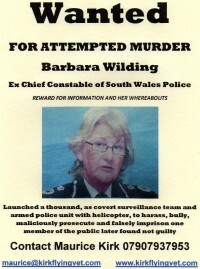 Before they picked him up in June 2009 an order had gone out that he was to be shot on sight if seen near the home of the Chief Constable Barbara Wilding. F. The Court needed two psychiatrists to sign the document to declare that Kirk was unfit to plead. Although whilst in his prison cell in HMP Cardiff I understand eleven psychiatrists tried to interview him a second doctor could not be found to corroborate that my brother had paranoid delusional disorder and was unfit to defend himself in court. hear Dr. W’s testimony that Maurice John KIRK has paranoid delusional disorder, a degree of brain damage and possibly brain cancer. H. His application for bail failed but surprisingly whilst awaiting trial no Prison Doctor came near him and no hospital appointment was made in relation to ‘possible brain tumour’! I. Needless to say he was extremely worried about his health once he had sight of the transcript and the doctor’s evidence. NO TREATMENT offered. J. The Firearms Jury Trial was rumbled as a made-up case by South Wales Police as we were told after the three week trial that the Jury were pretty sure that the Police had fabricated evidence from Day One. K. During the subsequent years (now 4!) he has attempted to have this false medical report removed from his health records and those held by HMP Cardiff. It has been in vain. L. He desperately needed a hip replacement operation as his ankle injury had put pressure on the hip joint. The anaesthetist was unable to accept him for treatment due to this incorrect report and in the end he had the operation in France. M. He re-applied for his Private Pilots Licence but this was refused because of the Doctor’s report. He re-applied to be reinstated at the Royal College of Veterinary Surgeons but this was refused based on Dr.
N. He had full scans on his brain at his expense (not in South Wales as the health service refused him) to ascertain that he DID NOT have a brain tumour nor appreciable brain damage. Wales Police in Court from concluding he had to go on hunger strike, before the Prison Medical Service admitted that the information in Dr. W’s medical Report of September 2009 was incorrect in its conclusions. relief when he needs it later in the evening. He is down to see the Prison Doctor in 6 weeks time! When you see how he treated animals in pain he now wishes he was an animal not a Human Being in the South Wales Health area. Q. He has tried and tried to get this false report removed from his file but it has proved impossible. NHS Wales have never co-operated in this. 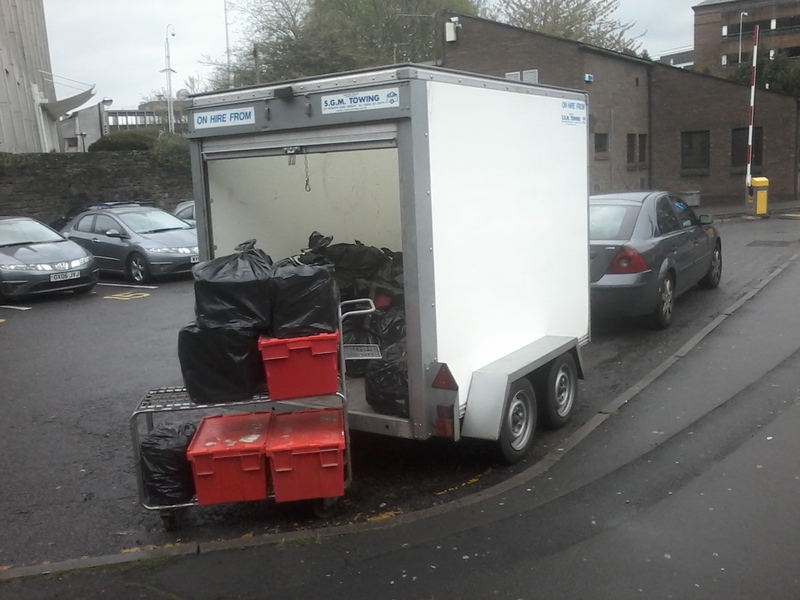 WORSE THAN the Gas Chambers – straight from HMP Cardiff to Ashworth – again!? WHAT DO Maurice Kirk, Robert Green, Gloria Musa and Melissa Laird have in common? Time to Join Dots! 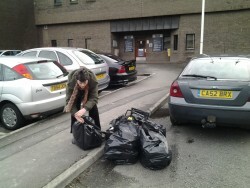 This entry was posted in Access to Justice, Background, Campaigning, Child snatching, Fair Trial, Family Courts, HM Court Services, Law Enforcement, Royal College of Veterinary Surgeons, South Wales Police and tagged Ashworth Hospital, Cardiff, Easter, HM Prison Cardiff, Maurice, Royal College of Veterinary Surgeons, South Wales, South Wales Police, Veterinary surgery. Bookmark the permalink. it is always a struggle to know what to say— but really, beyond speechless…..great summary though- that is soemthing that others need to read/ to understand what really going on there, lots there i didn’t know before. Don’t know what Maurice’s situation is right now but I wish him well. There is provision to apply to the High Court for a an Order correcting records if they have been falsely altered.It is expensive but well worth the money if the correct result is achieved. Further the application need not be that expensive as many lawyers do fixed fees for parts of cases. However if you want to succeed you are best off getting a reasonable Barrister first as last. They are around as are reasonable solicitors – such as me!! 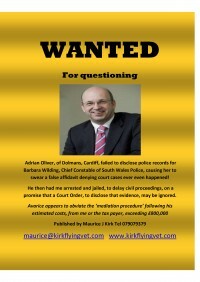 Maurice got sentenced to 16 months – only to protect that doctor who mis-diagnosed him with immeasurable consequences – and because South Wales Police pulls all the strings it possibly can to ruin Maurice and NOT to let him win his case against them. What do you do in such a case??? same here on that….pretty sure he’s yanking your chain Sabine!